Paula is a UConn Nursing triple husky and currently serves as Vice President of the School of Nursing Alumni Board. 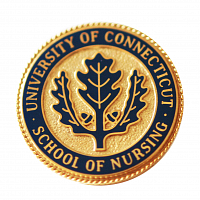 With over 35 years of experience in acute and critical care nursing, Paula has held numerous positions at hospitals throughout Connecticut and with the UConn School of Nursing. Her clinical experience includes over 20 years in critical care at UConn Health and St. Mary’s, 6 years in the Emergency Department, and several years in primary care pediatrics. Additionally, she has held positions as Trauma Director in two Level II trauma centers in Connecticut. At UConn, she served as an Associate Professor and Track Director for the AG-ACNP program from 2006-2018, an Associate Dean for Academic Affairs from 2012-2016 and in a joint appointment with the School of Nursing and the critical care service as an APRN from 2003-2012. Paula is active on The Nursing Research Council, the APRN Council at UConn Health, and on the University Committee for Interprofessional Education where she served as a faculty senator for 3 years. Paula has been an active member of the American Association of Critical Care Nurses since 1983 and served as a national Director from 2014-2017, Treasurer for 2015-2016, a member of the Nomination Committee from 2014-2016 and a member of the NTI API Program Committee in 2014. Paula has co-chaired the Connecticut League for Nursing’s statewide Dean’s and Directors committee and participated on the Advisory Committee and Data Committee for the Connecticut Nursing Coalition. Currently, Paula is President of the Mu Chapter of Sigma Theta Tau, having served as Treasure and Leadership Succession Chair in the past, and actively serves on the Leadership Committee as a member of the Connecticut Nurses Association. In June, she was inducted as a Fellow to the American Association of Nurse Practitioners. For many years, Paula has been a preceptor, advisor and mentor for graduate Nursing students, medical students, residents and fellows at UConn Health. Through her dedication to the field of nursing and passion for her work, Paula has made a tremendous impact on her students, colleagues and patients.